Spicy Middle Eastern style, Organic Gluten Free is great as a snack, with tahini sauce of fresh hummus! Falafel is a popular Middle Eastern food that has that rich taste, flavour, and texture. If you are looking for organic and healthy falafel to add to your diet, Amisa Organic Harissa Falafel Mix is the answer! Amisa Organic Harissa Falafel Mix is made using organic ingredients that support your lifestyle and satisfy your cravings for an authentic Middle Eastern snack. This falafel mix is easy to prepare, tastes perfect when partnered with tahini sauce or fresh hummus and is conveniently packed so you can take it anywhere you go. Amisa Organic Harissa Falafel Mix provides carbohydrates that fuel up your energy reserves, protein that will support growth and development, and dietary fiber that promotes the regular flushing out of body waste and increase the sensation of satiety. This falafel mix is 100% vegan-friendly and is free from dairy or gluten. Satisfy your cravings for authentic falafel anytime, anywhere... try Amisa Organic Harissa Falafel Mix! Have a question about Harissa Falafel Mix? What is it, what does it do, how and when to use or something else? Ask us. 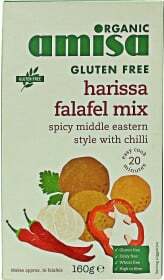 “Harissa Falafel Mix 160g” is currently out of stock. Enter your details below and we will let you know when it's back in stock.